Dentures should look good, work well, last a long time and never burden the wearer. The materials used to make dentures is also essential. The material quality, the right mix, and precise quality ensure high wearing comfort, natural aesthetics, stability, biocompatibility and durability of the partial dentures in Escondido. When it comes to standard dentures, the dentist may place a crown or bridge. By contrast, higher-quality models have veneer all around with ceramic rather than plastic. Modern CAD/CAM dentures are relatively cheap to manufacture and are known for consistently high quality and have an excellent fit. Many properties of partial dentures in Escondido depend on the denture material used: its sensitivity to heat and cold, biocompatibility (how it merges with the body) and the wear-and-tear involved. All these factors affect the life of dentures. In the following post, possible denture materials and their properties are discussed in more detail. Since very few metals are suitable as pure denture materials, manufacturers use alloys (i.e., dentures fused with other metals or non-metals). A distinction is made using precious metal alloys and non-precious metal alloys. Commonly used composites consist of palladium, silver, gold and titanium alloys as well as non-precious metal alloys (dental steel). Steel (special dental steel) is an indestructible, inexpensive, and traditional dental prosthesis material. Gold (dental gold, various alloys) is durable, body-friendly, and better tolerated than steel. However, the rising price of gold is making the classic gold crown more expensive. The preferred material used is no longer gold. Titanium or titanium alloys are corrosion resistant, biocompatible and less expensive than gold, but they are not as aesthetically pleasing. Titanium crowns are made less frequently and should be veneered for aesthetics. Dental implants (implant roots) embedded in the jawbone are usually made of titanium. Telescopic crowns or double crowns on the abutment teeth of dental bridges and partial dentures still have a sturdy metal core under the veneered metal crown. Fixing and connecting elements for dentures can be made of metal or zirconium. In addition to compatibility, resilience and its cost are two important factors to consider when getting partial dentures in Escondido. Dentists must precisely and permanently, for example, ensure that the crown edge can be adapted to the prepared tooth. Many metal parts of the dental prosthesis are veneered with plastic or ceramic to look natural. As a dental prosthesis, ceramics are more modern, aesthetically superior and often better tolerated than metal. In the history of dentistry, porcelain teeth were the first permanently aesthetic and biocompatible artificial dentures. Glass ceramics are manufactured with aluminum, magnesium or silicon oxide. They are highly temperature resistant and are partially processed at temperatures around 2732°F. Newly developed ceramic materials such as zirconia are not only suitable for ceramic veneers, but also for the production of frameworks and substructures for crowns and bridges made of all-ceramics. But they also serve as holding elements in combination technology. 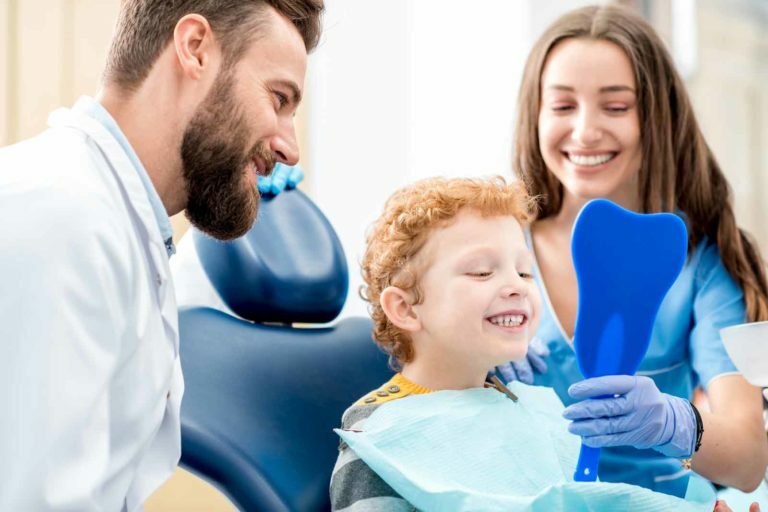 Dental prostheses with a zirconium oxide base may also be suitable for metal allergy sufferers because they are exceptionally dimensionally stable and resilient. On the other hand, zirconium oxide is a less hard and jaw-friendly ceramic fired as a veneer in several layers. Zirconia is biocompatible, gum-friendly and prevents new tooth damage. It can also be dyed to match the patient’s tooth color. Veneers are wafer-thin sheets made of ceramic, which are glued directly to the teeth (cosmetic tooth veneer). Plastic is the second choice for a denture material. It wears off faster, can discolor, and makes the dentures (and thus the remaining teeth) more susceptible to bacteria and mineral deposits. So far, there are no convincing high-performance plastics for permanent dentures, such as crowns. Thus, plastic is mostly used as a temporary option for the transitional period or cost reasons (e.g., plastic veneer crown). However, research is still evolving in this area. For example, scientists and dental technicians are experimenting with ceramic-plastic compounds to achieve better material properties. If a standard set of dentures are made with plastic or other materials that you would rather not have, the dentist can order higher-quality dentures from another manufacturer. Because of the high savings in laboratory and production costs, dental implants made of titanium or dental prostheses made of high-performance ceramics are also affordable for patients. Removable dentures or fixed dentures in Escondido should be thoroughly cleaned every day. This is the only way to ensure that your dentures will stay healthy for a long time without causing any problems. It also helps maintain the remaining teeth and ensures the health of gums. Bacteria are always present in the mouth, which can accumulate on the teeth and the prosthesis in the form of bacterial plaque. Also, leftover food and food residue between the prosthesis and the gum line may remain intact, which not only provide nourishment to harmful oral bacteria but also causes bad breath or inflammatory changes in the oral cavity if not removed on a daily basis. For these reasons, you should clean your dentures after each meal. If a person has removable dentures in Escondido, they should take the dentures out briefly and rinse them under running water to remove coarse food remnants. So that the dentures are protected, you should let some water run into the sink. If the prosthesis should fall out of your hand during cleaning, you can avoid damage by having some water pooling inside the sink. In addition to cleaning your dentures, you should rinse your mouth thoroughly with clear water before putting the dentures back into place. In addition to cleaning dentures under running water, people should thoroughly wash their removable dentures once a day. For this purpose, unique products are available at your local pharmacy or drugstore, for example, particular toothpaste and denture cleaning brushes. With these, people can reliably reach even hard to reach areas, without damaging the surface of the denture or connecting elements of the prosthesis. Cleaning tablets are a useful supplement but are not sufficient as the sole cleaning agent. Although they remove deposits by chemically softening them, mechanical cleaning is required to completely remove deposits and food particles. If a wearer is unsure how to properly clean and care for their removable dentures, they should ask his or her dentist.